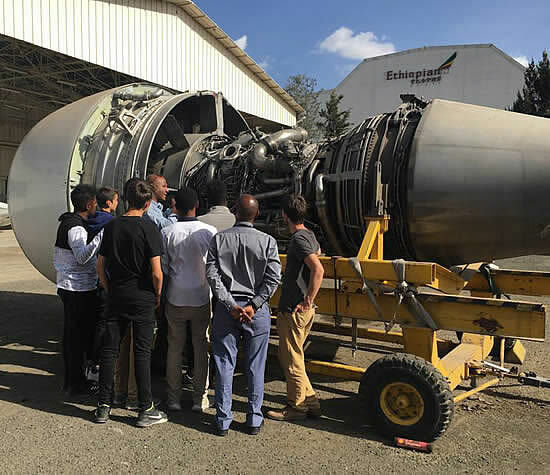 As the aviation industry faces an increasingly challenging recruitment environment, Krimson, the Ethiopia-based flight support company, is playing its part to support education at 'grass roots' level. Dawit Lemma, Krimson CEO, is providing volunteer teaching services to students taking the Brevet d'Initiation Aéronautique (BIA) course at the Lycée Guébré-Mariam, an Ethio-French school teaching Francophone pupils from nursery up to high school age in Addis Ababa. The weekly delivery of the two-hour educational sessions are shared with industry colleague Pierre Lucas, United Nations Humanitarian Air Service, UNHAS, Chief-Ethiopia. The class covers the fundamentals of aviation and aims to bring real-world experience to the academic studies. Upon successful completion of the one-year course, and passing of the standardized examination, students receive credit towards earning their private pilot license, PPL. Dawit Lemma leads a visit to Ethiopian Airlines with the BIA students. The BIA, which was created in 1968, is certified by the French Ministry of Education. Each year some 3,500 high school students choose this optional curriculum as part of the French public education system. This is the second year the Lycée Guébré-Mariam has offered the course and when the six-strong group of 15- and 16-year old students sit their exams in May a total of 16 pupils will have completed the program. Krimson, based at Addis Ababa Bole International Airport, launched in 2014 offers 24/7 support fulfilling a range of aviation services including ground handling, flight support, refueling, charter brokerage and aviation communications. Led by Dawit Lemma, a Swiss citizen of Ethiopian origins, the diverse team of aviation experts is committed to service excellence combined with care and discretion. Lemma, a qualified pilot, is also President of the AfBAA Ethiopian Chapter and has been integral to the Association’s development.